Rev Kate Bottley visits Mansfield College in Oxford to learn about Constance Coltman, the first woman to be ordained in a UK denomination over a century ago. Browse content similar to Pioneering Women. Check below for episodes and series from the same categories and more! so we celebrate Christian female pioneers past and present. Welcome to Songs Of Praise. She was obviously just an incredibly tenacious woman. and that is an inspiration in itself. survives from Elizabeth I's wardrobe. ..and the woman who launched her own Christian magazine. the most prolific was 19th-century American hymn writer Fanny Crosby. and this one is one of her most well-known, Blessed Assurance. a century ago, a significant moment in Christian history took place. in the UK to qualify for ordination. one final step before her role could be made official. Church of England didn't get women priests until 1992, 75 years later. in what's now known as the United Reformed Church. who has fond first-hand memories of Constance. So you remember her preaching? You remember her going up the steps and preaching? seen before, so it was something that really stayed in my memory. -Did it seem unusual to have a woman minister? -Didn't know it was unusual. -Cos it was really unusual, wasn't it? It was, it was. And I've only come to appreciate that as I was older. And, of course, the baton's been passed to you, hasn't it? Cos now you teach at Sunday school. I try to teach in Sunday school, yes. I started while she was still there. They left in 1940. So Constance was married to Claud, who was also a minister? That's correct, yes. And I remember them together. It's an amazing thing, isn't it? necessarily encouraged to work outside the home at all, were they? -And yet, here she was. -Yeah, not many women went to work then. And tell me about this photograph. So that's Constance in the centre with Claud just behind her. It was taken in the gardens at Wolverton. She was a wonderful woman, wasn't she? do all that with no prospects of being acknowledged as a graduate. -Do you think she was brave? -I do, I do. She must have been. Our next hymn is In Heavenly Love Abiding. -Tell me what you know about that hymn. -Oh, I love that hymn! to another pioneering woman, Queen Elizabeth I.
Josie d'Arby has been allowed in to see a new piece of Tudor history. Queen Elizabeth I herself, and it has a Christian connection, too. -Eleri, Josie, lovely to meet you. now kept under cover on the table. It's so precious, it can only be exposed for short periods. once worn by Queen Elizabeth I herself. So we have the real thing in front of us, which I'll show you now. to come and help me. revealed like this and I, for one, am incredibly excited. here at Hampton Court have only recently removed the backing. the only object of dress that survives from Elizabeth I's wardrobe. It's made from cloth of silver. very highest levels of society - generally, only royalty. It's as true as the day that it was embroidered. worn here at Hampton Court. Now, we're talking about pioneering women. Why, for you, was she a pioneering monarch? testament to the power and control that she wielded. And she felt very guided by God throughout her reign, didn't she? She said, "I will not make windows into men's souls,"
loyal subjects to her, she was very tolerant of those differences. And the imagery has Christian significance? motifs of the natural world, which was in reverence to creation. Elizabeth was a very devout queen and woman. and her people. So she did pray every day for God's guidance. This is remarkable and stunning and very beautiful. -Eleri, thank you for sharing it with us. -Thank you. Thanks for coming. studied here at Mansfield College in Oxford over 100 years ago. and has been a United Reformed Church minister for nine years. she and I have both been inspired by the story of Constance. She pushed the boundaries a lot. suffragette movement, so it was about peaceful negotiation. She was a pacifist, obviously just an incredibly tenacious woman. She didn't take no for an answer. our male colleagues don't in terms of breaking ground? when people started saying to me, "I could see you as a minister,"
because I kind of didn't think I fitted a mould. -Does that make sense - a mould? -Yeah, that really resonates with me! And so, I was, like, no, no, no, no, no! something would happen that made me go, OK, OK.
needs to say to me, "When are you going into ministry?" And, 10 people later, I just put my hands up. I'll just see how far I can take it. And I presumed that, at some point, someone would just go, "No!" at some point, is going to realise? and stop me from doing this. I'm not allowed, surely? I'm not grown-up enough to be a vicar! leading all ages in different forms of worship and community projects. I just can't do this, I've got nothing to give. somebody asks you for some advice and you just go, oh, my goodness! And I don't even have to understand it - I just have to go, wow! This is and I am and God is. And that's where the blessing is. Constance will be waiting for us, don't you? going, "Ooh! Well, mine was like this, and my ministry was like that!" Yeah, I think my worry might be she'll go, "Oh, no, you got that fact wrong!" so we've got good form. gone out and had a good old gossip, we wouldn't be here, would we? -So hurrah for Mary Magdalene and Constance! just two years ago, and it's already become a worldwide favourite. Our next hymn combines the new with the old. and the tune was composed in 1997 by musician Vikki Cook. Christian women have been pioneers in all sorts of different ways. to combine her faith with a passion for fashion. to kind of express your personality. and has worked for big companies, including Burberry and L'Oreal. but actually I found it very full of life. that's innovating, I found a very enriching experience. the first print edition of her Christian magazine called Magnify. or they are kind of unsure as to what they think about faith. And I really wanted to create a platform that they could engage with on their levels. Why have you called it Magnify? "My soul magnifies the Lord and my spirit delights in God my saviour." has always been to see Christ magnified. Who is your ideal reader? Who are you aiming this at? who are very intelligent, who think deeply about things. And so the kind of surface-level answers don't really do it for them. I know that you have three Fs that you abide by. Can you talk to me about those? which often people have to take a step back. the heart of the magazine. was seen by some as a big risk. and people are like, "Oh, what are you doing?" "Oh, you're doing a Christian magazine? OK. All the best with that!" what would be next would be better than what I was leaving behind. that is positive and enriching. Do you feel like a pioneer within your industry? is creating something that doesn't exist. but my personal relationship with God has got to be front and centre. to be inspired and to be empowered. opens doors that we never could have imagined or expected. That's almost it from Oxford. And joins Bishop James Jones planting brand-new oak trees. 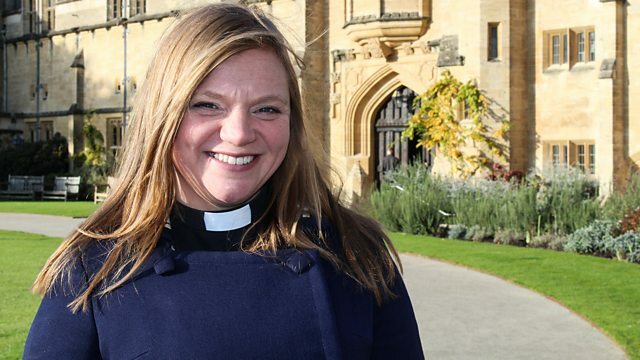 One hundred years since British women over the age of 30 first got the vote, Rev Kate Bottley celebrates pioneering Christian women. She visits Mansfield College in Oxford to learn about Constance Coltman, the first woman to be ordained in a UK denomination over a century ago. Josie d'Arby gains exclusive access to an exquisite 400-year-old church altar cloth which experts say is from a skirt actually worn by Queen Elizabeth I. Josie also meets Ruth Awogbade, who launched her own Christian fashion magazine. And all this week's music, from across the UK, is inspired or written by women. Music: Blessed Assurance - LSO St Lukes, London In Heavenly Love Abiding - St German's Church, Cardiff What a Beautiful Name - St Catherine's Pontypridd Before the Throne - Enniskillen Take My Life and Let it Be - Romsey Abbey He Will Hold Me Fast from Belfast - Kristyn Getty Tell Out My Soul - St John the Baptist, Tideswell.